What is the most important document in any person’s job search? The answer is your ACTION PLAN. Having a great resume and other job search resources is useless unless they are used effectively to gain access to job opportunities, receive interview invitations and ultimately land your perfect job. You cannot build a house without a detailed set of plans, and similarly to build a results oriented job search you need a strategic Action Plan. 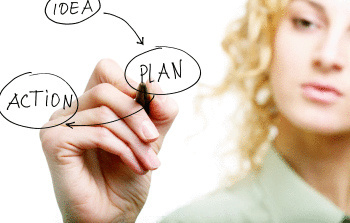 So what are the major components of an Action Plan? Using the SMART goals (SPECIFIC, MEASURABLE, ATTAINABLE, RELEVANT, TIME BOUND) a targeted Action Plan can be built, bearing in mind that a mature job search consists of a broad range of activities and not focused only on a couple of actions. In most cases a job search is a long term exercise that is easily derailed by outside pressures, so a well-crafted Action Plan will keep you focused on the task that is really a “full time job” …a job search it is not a holiday. Measuring the success of each job search activity needs to be viewed over the longer term as it often takes time to start getting results. Patience, resilience and self-discipline are key components to any successful job search and this is where a well-designed Action Plan can put structure into any job search. Remember that your Action Plan will hold you accountable and able to measure your success against a pre-determined set of goals. Nothing like “a bit of accountability to keep people motivated”! A good Action Plan is also a living document that can be added to once the initial actions have been accomplished, or modified if necessary as additional workplace intelligence is gathered. At the heart of any successful job search is an Action Plan…a fundamental document that cannot be ignored.